Beginning the year with an enhanced commitment to Micro, Small and Medium Enterprises (MSMEs) in India, IndiaMART.com, India’s largest online B2B marketplace has launched its new nationwide brand campaign earlier this month on January 12. The drive goes live or radio, a medium with growing popularity in the country, and covers leading stations such as Radio Mirchi 98.3 FM, Big 92.7 FM, Red 93.5 FM. Capturing the airwaves, IndiaMART jingles will air on these radio stations across 15 cities; viz: Delhi, Mumbai, Kolkata, Chennai, Pune, Ahmedabad, Hyderabad, Bangalore, Surat, Rajkot, Vadodara, Jalandhar, Kanpur, Indore and Gwalior. The company is bullish about this new brand awareness campaign. “Since our inception, we have given our best to be a part of the MSME growth story in the country. We believe in the business potential that MSMEs possess, which can quadruple with them going online. We associate high importance with the same in every brand awareness drive we embark on. With this new campaign, we aim to further enhance our dedication to the MSME sector and build our identity, which is rooted in doing what we say,” said, Dinesh Agarwal, Founder and CEO, IndiaMART.com. The campaign has also commenced in print, online, outdoor and other media across the country since last week. It will cover leading newspapers (financials, mainlines, vemaculars), magazines(trade and business), and websites besides unique channels for outdoor branding. 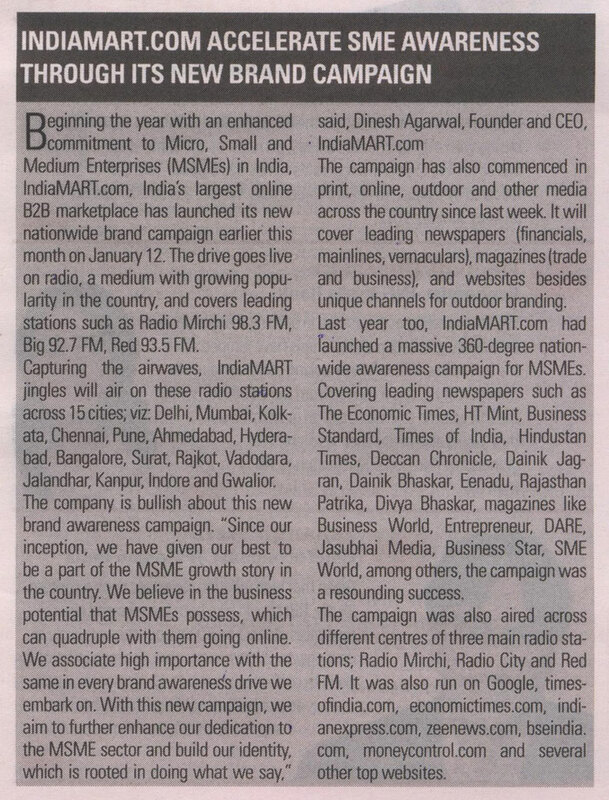 Last year too, IndiaMART.com had launched a massive 360-degree nationwide awareness campaign for MSMEs. Covering leading newspapers such as The Economic Times, HT Mint, Business Standard, Times of India, Hindustan Times, Deccan Chronicle, Dainik Jagran, Dainik Bhaskar, Eenadu, Rajasthan Patrika, Divya Bhaskar, magazines like Business World, Entrepreneur, DARE, Jasubhai Media, Business Star, SME World, among athers, the campaign was a resounding success. The campaign was also aired across different centres of three main radio stations; Radio Mirchi, Radio City and Red FM. It was also run on Google, timesofindia.com, economictimes.com indianexpress.com, zeenews.com, bseindia.com, moneycontrol.com and several other top websites.